Netsparker identified that the application is using Basic Authorisation over HTTP. Basic Authentication sends username and password in plain text. If an attacker can intercept traffic on the network, he/she might be able to steal the users credentials. Move all of your directories which require authentication to be served only over HTTPS and disable any access to these pages over HTTP. All sensitive data should be transferred only over HTTPS. 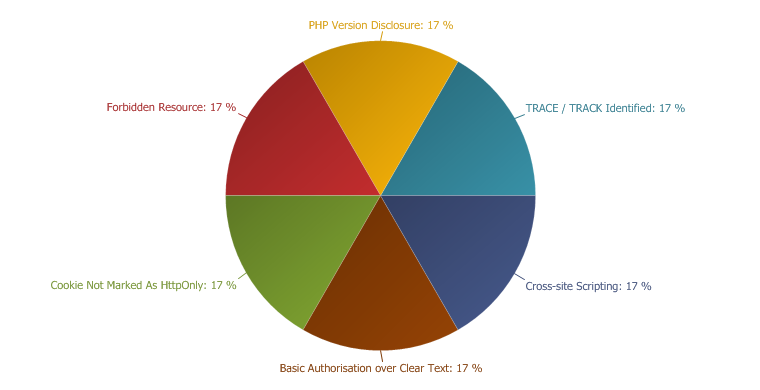 Netsparker identified that the target web server is disclosing the PHP version in use through the HTTP response. This information can help an attacker to gain a greater understanding of the systems in use and potentially develop further attacks targeted at the specific version of PHP. An attacker can look for specific security vulnerabilities for the version identified. Also the attacker can use this information in conjunction with the other vulnerabilities in the application or the web server. Netsparker identified that the TRACE/TRACK method is allowed. If the application is vulnerable to Cross-site Scripting and uses Http-Only Cookies then an attacker can bypass the Http-Only cookies limitation and read the cookies in an XSS attack. Disable this method in all production systems. Even though the application is not vulnerable to Cross-site Scripting a debugging feature such as TRACE/TRACK should not be required in a production system and therefore should be disabled.